How are my clocks created ? 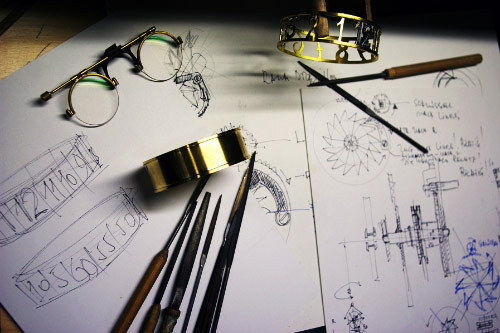 Sketches show loosely connected thoughts, untreated brass and steel are lying on the table. Later, as soon as gearwheels and levers fall into place for a first play, the mechanical and artistic possibilities of an idea begin to emerge. A regular, precise interplay of handmade components aims to follow a general agreement by humanity about the measurement of time. But on this creative journey nothing is fixed. 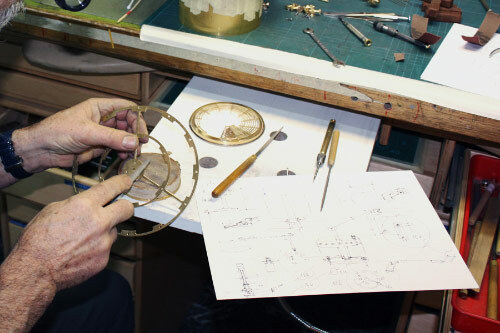 Many great inventions have been made in clockbuilding, but who can measure all that which has not been discovered yet ? Sometimes a painstakingly produced gearwheel breaks, a construction does not work as expected, or a detour is necessary to learn a new technique. But in many hitches and obstacles there is a hidden hint. An idea can sparkle and reveal an unknown path. 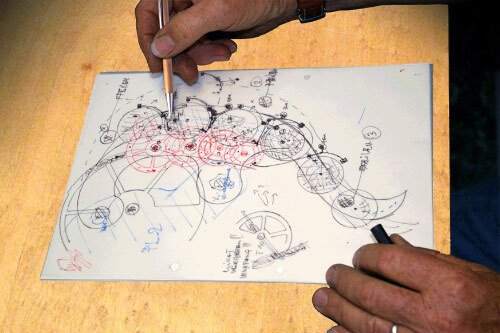 For me, constructing a clock is a playful and fascinating experiment. In order to give the as yet undiscovered element a chance to come to life, I try to surprise myself without worrying about failure. The inexorable passing of time may be one of the reasons I only manufacture unique timepieces. Indeed who wouldn’t like to exhaust as many possibilities and discover as much as possible? Just like in my past life as a kinetic artist, I would like to arouse the curiosity of observers and to hear their questions about my creations. I see a clock as much more than just a timepiece. Through its form, it can pass on something of what I experienced when creating it. It is the joy of precise movements, of sounds, of harmonic forms, and of the inexhaustible possibilities to answer one main question: what exactly is a clock?